Are you striving for perfection in your work life? Our goals at DGS include striving for perfection in providing the finest-quality products and services to our customers. We strive to do this more efficiently than our competitors. By servicing our customers’ needs customers will continue to do business with us and will highly recommend our company to others. Our employees are our most important asset in accomplishing this goal. Our employees’ high regard for our customers directly influences our company’s reputation. Be part of a team that cares! 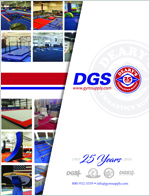 We are glad you have shown interest in DGS and Gymsupply.com!